Had a great day at WordCamp Milwaukee 2013 Saturday! We had 280 people pre-registered, with very few unclaimed badges at the end of the day, plus a few folks who registered at Bucketworks. The place was packed from the opening remarks through the after-party at Milwaukee Brewing Company. I attended Aaron Holbrook’s session, “WordPress is a CMS, Dammit!” This was the first time I’d heard about the Advanced Custom Fields plugin that simplifies and extends custom post types, but it would come up several times in the course of the day. Looking forward to trying that out here soon. Next up was Gloria Antonelli‘s “Theme Selection Field Guide.” This may have been my favorite session (and I hope she posts her slides). She offered a great set of guidelines and gotchas when looking for a theme for your site. Main takeaway: Too many ThemeForest developers don’t understand how WordPress works, and thus break things when you install their theme. Lisa Sabin-Wilson offered a funny excursion through some hard-won experience in managing projects (and expectations) in “Scoping Projects to Avoid Stress, Headaches and Angry Mobs.” Next time you see her, be sure to ask about the FBI. The lunch line snaked all the way through Bucketworks and out onto the sidewalk by the time I got in it, but there was plenty of sandwiches and salads from Milwaukee’s Waterfront Deli left even for the stragglers. Conversations carried on throughout the building over lunch, and I got some last-minute prep time for my presentation. The session I led this year was amazing! The assembly of around 50-60 animated and inspired people. Unlike last year, my computer cooperated, and I didn’t try to pack too much information into the allotted half-hour. This resulted in an excellent discussion of “Building Authority and Audience with WordPress and Google Authorship.” Thanks to all who attended, asked questions, hit me up later and just thought good thoughts. After my talk, I volunteered for an hour at the Happiness Bar, but no one came with any problems. So I chatted with the other folks and checked in at home. Next up was Heather Acton’s terrific session, “Stop Giving S*** Away for Free and Start Feeding Your Family.” She complemented Lisa Sabin-Wilson’s talk quite nicely with her rules for freelance web designers, new and old. When your friends and family hear you can make web pages, you can often be hit up for favors. It’s just too easy to be “nice” and wind up being exploited. Writers run into the same problem. Heather has managed to balance pro bono work for nonprofits and still use her abundant talent to make a decent living. 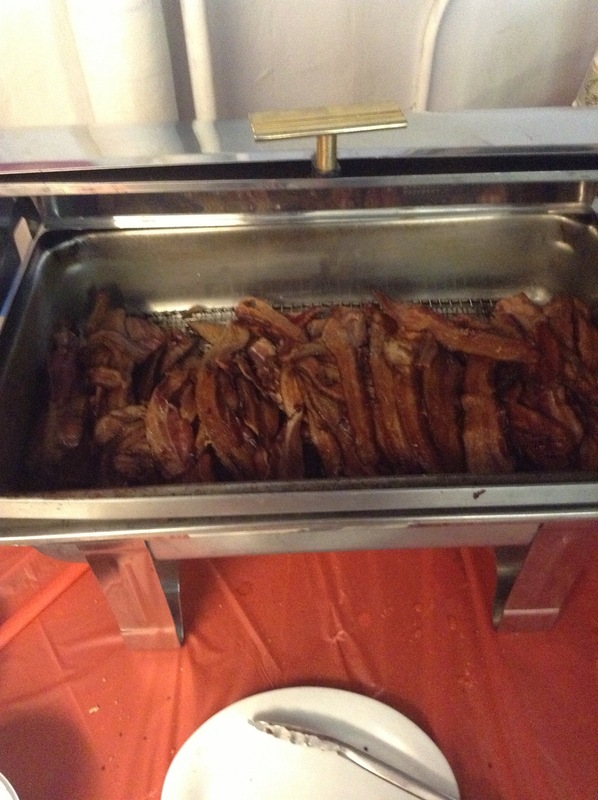 But just before that session started, our afternoon snack arrived, and a legend was born: the WordCamp Milwaukee Bacon Bar! So maybe there wasn’t a lot of variety to the bacon, but it was fresh, and there was lots of it! People lined up with plates big and small to take back to their session. You can find many pictures of the spread (besides this one I took) using the hashtag #baconbar. As a technical communicator, I was naturally attracted to Jamie Schmid’s talk on improving the user experience for the WordPress Admin page. While still a little distracted (Scott Offord’s always popular SEO talk was generating much Twitter-love at the same time), Jamie’s discussion of how Advanced Custom Fields makes it possible to use structured text in WordPress piqued my curiosity. Kristof van Tomme has been working for some time to make Drupal a decent platform for software documentation by supporting the Darwin Information Type Architecture (DITA). I have waited for WordPress types to do similar work; perhaps this is an incentive to look a little harder. After a long, hard day, many of us retired to the AfterParty at the Milwaukee Brewing Company. This party featured generous beer samples, mini-tours of the brewery, a variety of pizzas and bruschetta snacks from Transfer Pizza down the block, and Purple Door Ice Cream. A great way to end the day. I had other responsibilities on Sunday, but I hear that went really well too. You can find links to nearly all the slide presentations with this Google doc. Watch WordCamp TV for recordings of the talks. I am so looking forward to 2014, but worried how we’re going to top this year. Were you able to come to WordCamp Milwaukee 2013? Have any ideas for next year? Want to hear more about Google Authorship? Feel free to share your thoughts in the comments below (and over at the WordCamp Milwaukee site too). Getting Ready for WordCamp Milwaukee 2!